When you want to walk your dog safely, the KONG HandiPOD Flashlight Dispenser is the perfect tool! The compact HandiPOD combines a poop bag dispenser with a bright led torch. This allows you to walk your dog at night without a worry. The poop bags that come with the HandiPOD are top quality, biodegradable and have handles. Are you uncomfortable walking your pet late at night, because of how dark it is? With the HandiPOD Flashlight Dispenser from KONG you will always be able to walk your dog safely! The compact HandiPOD is a poop bag holder and torch all in one. The powerful led light is incredibly bright, so you can see clearly at night. What's more, it also contributes to your dog's safety as well as your own. The poop bags that come with the HandiPOD are high-quality, biodegradable and have handles. The HandiPOD is also available as a mini variant. Are you out of poop bags? 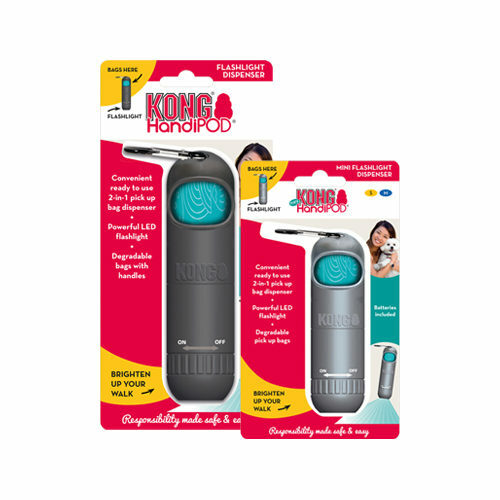 Find the refill packs here: KONG HandiPOD Pick Up Bag Refills. The HandiPOD combines a poop bag dispenser with a powerful torch. A mini variant is available for small to medium-sized dogs. Have you used KONG HandiPOD Flashlight Dispenser before? Let us know what you think about this product.